A new series on the most misunderstood book in the whole Bible – Revelation. It’s not all doom and gloom like you’ve probably been told. We believe that Revelation is an invitation for us to imagine a better world. The Imagine series artwork comes from the Apocalypse Tapestry on display in the Angers Castle in France. This amazing work of art stands in sharp contract to the bedsheets strung across the front of many churches during their “Prophecy Conferences.” Those bedsheet scrawlings claimed to have all the answers and were designed to evoke fear in us. This tapestry, on the other hand, prompts us to imagine. Imagine a crazy world in which God is at work. In the midst of suffering, our vision grows dim, and it’s easy to embrace the indulgent fantasies of doom and gloom peddled so often by the church. But what if God’s message was like God himself? The kingdom of God is like a mustard seed – the infinitesimal spark of hope that cannot be denied, that explodes in transformative change. And so, Jesus, as you invite us to envision a better world, let us join you, not giving way to our baser fears, but with hearts open to the grace and peace that you extend. Going through some real hard stuff. That’s what Revelation is about. The people who were part of the seven churches addressed by Jesus in Revelation 2-3 lived within the Roman Empire, ruled at the time by Domitian. 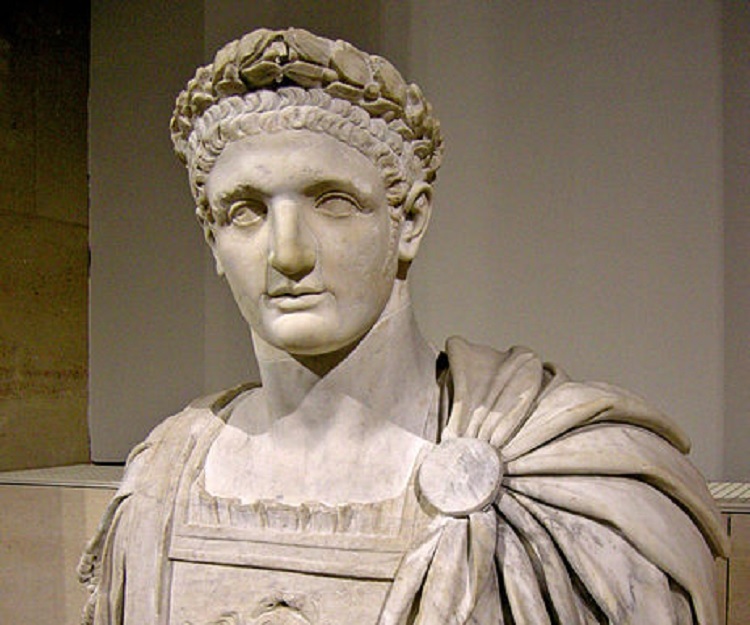 Domitian was a particularly able but cruel monarch who persecuted anyone who didn’t follow the civil religion that kept the Empire in power. Read more about Domitian’s reign in the classic Foxes’ Book of Martyrs. At times, hope is a phantasm, a taunting chimera. The world is too dark. I am too dark. There can be no victory. But the power of God is greater. In the midst of raw-throated cries in the night, of 12 steps and last breaths, God’s love is greater. Even in the midst of unbelief, Jesus is there. He is always there. His call is beckoning. So, are you awake? Listen. Listen to the wind words, the Spirit blowing through the churches. Have you heard of the myth of redemptive violence? It’s a story we tell ourselves in movies and TV shows. It’s also told to us by politicians. It goes something like this – to win against evil, you have to conquer it with overwhelming strength. Revelation tells a much different story. What power, it seems, courses through our anger. Indignant at the slights, both petty and great, that dare to threaten our wholeness, we encase ourselves in vindictive rage. We strike out, believing that another’s pain could heal our own. We cling to such a simply lie, grasping at the illusion of control, the false promise of power. But Jesus waits for us to hear his whisper. There is another way. There is a better way. Come, let us follow in the footsteps of the lamb that was slain. Let us beat our swords into plowshares, for the fields of love are ripe for harvest. The return of Jesus is a big question people talk about when they discuss Revelation. The biggest question of all is one of timing – why does Revelation seem to indicate that Jesus will return soon and we’re still waiting 2000 years later. Was John wrong? Is Revelation wrong? Even worse, was Jesus wrong? On his blog, biblical scholar Peter Enns hosted a three-part series about why Jesus hasn’t yet returned. It’s based on a book called When the Son of Man Didn’t Come: A Constructive Proposal on the Delay of the Parousia by Christopher M. Hays and C.A. Strine. Who is in running this thing? Is anyone strong enough and good enough to be trusted? These are the questions ringing in our ears and echoing through heaven. Benediction – Who Is Worthy? In Syria, tanks rolls determinedly over rubble toward the shattered city of Aleppo. They roll past ghostly bombed-out ruins, past children who run from yet another symbol of the constant terror they face each and everyday. In Charlotte, gun shots pierce the night sky. Crowds of protesters scatter, fleeing from the violence of riots, the tide of riot-gear laden police, all the while left with one abiding despair – this city may always be broken. In Springdale, balloons rise amid the gathering silence for a bright star who faded too soon – too unconscionably, unfathomably soon. The literature of Revelation might remind us of sci-fi or young adult dystopia. And maybe that’s a great way to think of it. Thank you, Lord, for the book of Revelation, for its vivid reminder that we don’t have all the answers. And thank you, God, for the book’s message of restoration. With the world as it is, with the way our lives are at times upended by such grief and loss, it is hard to cling to hope. These, it seems, are dessert times. So we chase after you, Jesus, knowing that only you can lead to springs of living water. In Revelation 12-14, John describes the Roman empire … and all empires … in stark and scary terms. He talks about a dragon. He describes a powerful beast that demands allegiance. And then a second beast emerges with the charismatic ability to draw people in. The empire wants power. It wants might. And it gets these things through violence and its weaponry. Revelation is one of the most misunderstood books in the whole Bible. What if it’s not actually about the end of the world? What if it’s inviting us to imagine a better world … once the empire ends? God, again and again, you lift our gaze to you in the heavens, but so often we pin our hopes to these paltry, earth-bound citadels we’ve built. But the Empire can’t save us. We wrap ourselves in falsehoods of our strength but nothing fashioned by these faulty hands can stand. Jesus, your way is insurrection. It unravels all we cling to. It is strength through weakness. It is power through sacrifice. It is surrending ourselves, only to be saved. Jesus, lead us to your better way. Give us patient endurance, faithfulness, and wisdom. Let us pin all of our hopes on you. Does Revelation have anything to say about the election of 2016? Too often, we pledge our faith to the vain efforts of man. Brick by brick, we build our empire, believing it to be the kingdom of God. Yet no tower stands forever. But God is mighty and everlasting. And his voice can be heard above the din, “There is a better way.” He calls us to look after the orphans and widows in their distress and to keep ourselves unstained by the world. And he reminds us – red, blue, anarchist, or plutocrat – there is no label greater or truer than child of God. Jesus, let us choose love. Let us choose you. We speak so casually and glibly about the idea of judgment. We can be quick to condemn without really considering what we’re talking about. Death and destruction. Justice. Eternal conscious torment. These are not topics to take lightly. Revelation 14-16 - What's the Deal with Judgment, Anyway? Benediction – What’s the Deal with Judgment, Anyway? For at times, we cannot reconcile the torrential torments that plague this earth with a God who is in control. A host of men, women, and children surround the ISIS fighters in Mosul, a human shield, breathing bodies – dying in such senseless slaughter. How? How can this stand? And yet – closer still – how can we reconcile the murder we harbor in our hearts with a God who forgives? And where can we turn when with all our burning anger we still fail to right the order of this world? We turn to you, Jesus, with nothing clear, no solid answers. We rest in you, the judge of all the earth, trusting that you’ll do right. So many people reading Revelation as a story about the world spinning out of control. But what if the story is actually about the world spiraling toward something better? Sometimes it seems that death comes all too often and dying – dying is all too easy, and, at the same time, the hardest thing of all. There are things within us that need this death, that’ll rake their frenzied claws against us to fight to survive. But God invites us to let go, reminds us that through the baptism of death, we are raised to new life, reassures us because he has lived, and died, and lived this himself. And upon that, we pin our hopes. This reminder that we are – none of us – to judge, but to love, to welcome all who wander among us here. For a fractured and hurting nation, could a message about healing help? So many – panicked and uncertain, threatened and scared – so many hurting. In this wild and whiling world what can we say? But how long? How long, Lord? It seems we have so little to offer. But what we do, let us give freely, let us serve, be grace and peace for the nation for however long it takes. Christians can get so worked up about the return of Jesus that they miss being the presence of Jesus in a world that so desperately needs him. In this season of Thanksgiving, do you give thanks for Jesus too, not just food and friends? As we conclude Revelation, do you revel in what was revealed? That we can imagine a better world – now and not wait for that unknowable “soon.” That we don’t have to go along with the Empire. We can instead stand for truth and grace. Come, Lord Jesus. Come out through us so we can work for a better world, so when we show up, Jesus is there. The bight morning star, looking for the light, living in a better world.